Heimtextil, the largest international trade fair for home and contract textiles. Heimtextil is scheduled for 12 to 15 January at Messe Frankfurt, Germany. 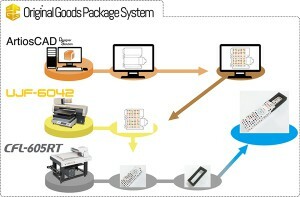 Mimaki will be located in Hall 4.0, Stand F15. PSI Düsseldorf, the leading international trade fair for the advertising industry. Hosted by the Promotional Product Service Institute, PSI 2016 is scheduled for 13 to 15 January at Messe Düsseldorf, Germany, where Mimaki will be in the Technology Forum, Stand 12B13 TF. Salon C!Print Lyon, France, scheduled for 26 to 28 January, perfectly tuned to the evolving needs of the printing market, which requires creativity and innovation. 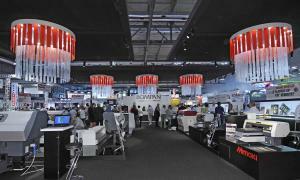 The Mimaki team will be inspiring attendees at Stand 2K12/L11. 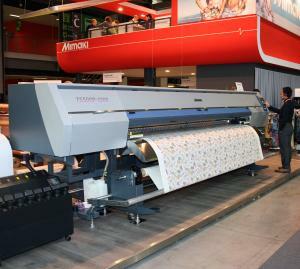 The TS500P-3200, a 3.2 meter concept printer that prints on transfer paper with sublimation ink. The TS300P-1800, a 1.8 meter printer that also prints on transfer paper and will be shown using brilliant pink and yellow fluorescent inks, much in demand especially in the sports garment industry. 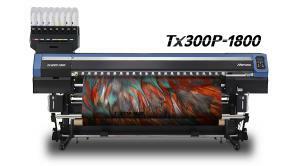 The TX300P-1800, a 1.8 meter printer that prints directly on textiles with disperse dye ink, enabling printing directly on polyester, as well as with textile pigment inks for printing on cotton. A smash hit at the recent ITMA 2015 show. The JV400LX, using CMYK, Orange and Green Latex inks for printing wall coverings with a stunning colour gamut. Mike Horsten, General Manager Marketing EMEA, Mimaki Europe BV, will also be presenting at the European Digital Textile conference on January 12th at 11h-11h20 in Hall 4.0 on „The new supply chain for super-fast home textiles“. The brand-new UJF-7151 plus, which will also take the limelight at C!Print Lyon. It is the next generation model of the world’s best selling UJF Series line from Mimaki. Its design and technologies enable sign, specialty graphics, and award and personalisation companies to realise the benefits of digital printing with higher margins and lower production costs, without compromising quality. The JFX200-2513 LED UV flatbed printer ideal for signs and display graphics that prints on a wide range of substrates with a choice of inks, including white and clear. It’s easy to use and has a compact footprint to fit into almost any production space. The UJF-3042HG, including the Kebab option to enable printing on round surfaces and cylinders, a tabletop flatbed printer that can print on a variety of substrates, including plastics, metal, wood, leather and glass in sizes up to 30cm x 40cm. There are three different UV-curable ink types available, plus white and clear, to address a huge variety of printing needs. 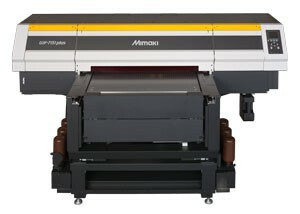 The CFL-605RT compact flatbed cutting plotter, the ideal complement to Mimaki digital printers. This 50cm x 60cm cutter supports on-demand production with multiple functions including reciprocating, tangential and eccentric cutting, plus creasing for immediate finishing of packaging and prototypes. 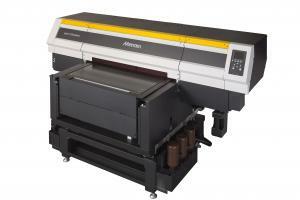 The UJF-6042 flatbed printer with the CFL-605RT compact flatbed cutting plotter. The UJF-3042HG with the popular Kebab option for the ultimate in-production flexibility. The TS300P-1800, printing on transfer paper for fabric applications and featuring yellow and pink fluorescent inks. Check out the blog dedicated to the (print in) sports segment.